Rome’s victory in naval battle resulted in the final Carthaginian defeat in the First Punic War. But Hamilcar Barca’s corps of 20,000 mercenaries had remained undefeated on land. These troops were shipped back to Carthage, and finding that their considerable back-pay was not immediately forthcoming, mutinied under the leadership of a Libyan, Mathos and a runaway Roman slave, Spendius. 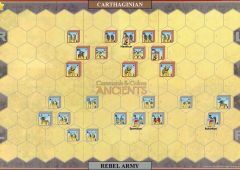 Mathos was also able to raise a great rebellion amongst the Libyan tribes. 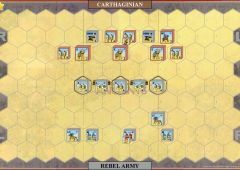 The rebels placed two loyal cities, Utica and Hippacritae, under siege. 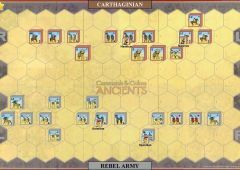 At the start of the rebellion there was no Carthaginian army to oppose the rebels. The senate appointed Hanno the Great to raise and train a field army. The civil militia and cavalry were called out and he quickly equipped and drilled his units into shape. Hanno was confident as his force took the field and advanced on the rebel army near Utica. Hanno's elephants, supported by ballistae fire, overran the rebel camp, but unlike his success against the Libyan revolts, where the tribesman fled for days once defeated, these rebels were veterans, who regrouped and counterattacked. 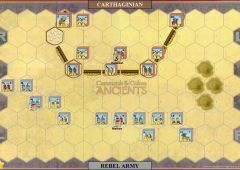 They stormed back to retake their camp and routed the Carthaginian militia army. 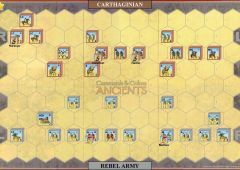 Hanno withdrew the shattered remnants of his army back to Carthage. Both sides gain or lose Victory Banners for possession or loss of Camp hexes. The Rebels start with 2 victory banners for possession of all 3 Camp hexes. Both sides gain/lose 1 Victory Banner for possession/loss of 1 or 2 Camp hexes; gain/lose a second Victory Banner for possession/loss of all 3. • Movement: 1 hex, move—no Ranged or Close Combat, may not double time. • Fire Range: 6 hexes—Fire Dice: 2. • Close Combat: 2 dice, no sword hits. • Evade: May. If not eliminated on attacker's roll, any remaining blocks are removed from battlefield, but unit does not count for a Victory Banner.